Despite difficulties during the gruelling four-day Rally of Turkey, Latvala and co-driver Miikka Anttila felt the Ford TeamRS developed car had moved forward since its world rally debut in Greece earlier this month. "The steering, the traction and overall handling of the Fiesta have improved since Greece. I still have a lot of learning to do in terms of how to drive a JWRC car, but we'll get there! 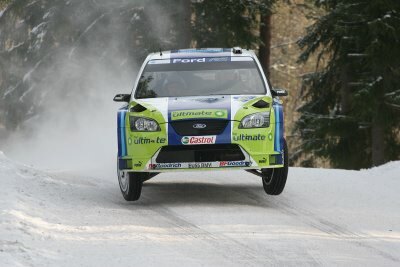 I'm looking forward to testing the car in July in Finland," said Latvala. Latvala and Anttila, driving an Astra Racing run car, began their second event in Antalya, south of Istanbul, on Thursday evening. Along with 20 JWRC competitors they crossed the ceremonial start before completing the Superspecial stage. The hottest event of the season continued early on Friday when Jari-Matti and Miikka were faced with 149.33kms of competitive stages in temperatures soaring as high as 38 degrees, on the rough mountain roads, high above the service park at Kemer. However, it wasn't a trouble free day for the Finnish pair. They hit a rock on SS3 and bent the fuel vent which resulted in them driving slowly to the end of the stage, losing 14 minutes. On the following stage they bent the front wheel and broke the water pipe, forcing the crew to retire. Under the new "SupeRally" rules the crew were permitted to restart the following leg on Saturday. With Friday's problems resolved, they went out and set some encouraging stage times, driving carefully and at the right pace. Unfortunately, on SS10 they felt a shock on the front left damper and found that oil was leaking from it onto the clutch. When they reached the start of SS11 the clutch was slipping so badly they were unable to select first gear. They decided to withdraw. Jost Capito, Director of Ford TeamRS commented: "Astra Racing have spent the 10 days since the Acropolis Rally addressing the problems they experienced and we're encouraged that those problems have not arisen this weekend. Jari-Matti is pleased with the handling of the car, but we obviously have a lot of work to do."